A dynamic revitalization of the downtown area was ignited in 1991 when the new Seattle Art Museum opened its doors. Although it was designed by husband and wife team Robert Venturi and Denise Scott Brown, it is often only he who gets the credit. Ms. Scott Brown, that isn't gonna happen here. 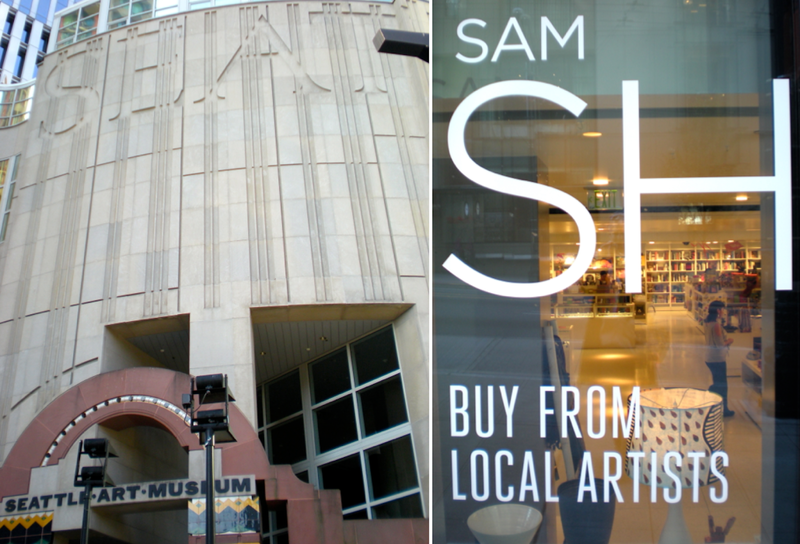 SAM has three locations spread throughout the city. 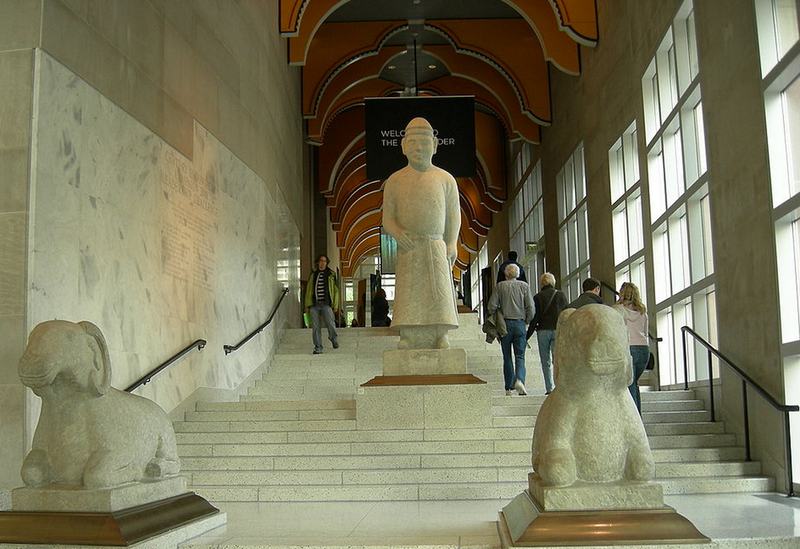 The other two are Olympic Sculpture Park on the city's waterfront, opened in 2008, and the Seattle Asian Art Museum, which is housed in the former home to SAM. Today we'll focus on the contents of this main building, set on a hill in the middle of bustling downtown Seattle. An electric motor powers the arm of Jonathan Borofsky's Hammering Man as he "hammers" (quietly, to the relief of neighbors) from 7 am to 8 pm every day. See the motor on his arm? Each evening and every Labor Day, he gets to rest. There are many versions of this sculpture around the world, and each one is marked with a unique number. Seattle's is #3277164, and to date, it's the second largest in the world. You can see another one, set in a more open environment, in the Nasher Sculpture Park post. The gift shop's street entry makes it easily accessible to the public. How refreshing to see the sign encouraging passersby to "buy local". Seattle and its surrounding area, home to companies like Microsoft, Amazon, Nike, Starbucks, and the Super Bowl champion Seahawks, can well afford to support its artists. Culture Clash! Chinese born artist Cai Guo-Qiang's Inopportune: Stage One features nine cars that hover over the lobby in mid-air, mid-flight, intermittently spitting fire-cracker light in slow motion. A moment stopped in time. Born in 1957, the artist, who now lives in New York City, was heavily affected by the sounds of explosions, heavy artillery and gunfire, as well as the social upheaval that accompanied China's Cultural Revolution, as is demonstrated by this installation. In a calmer setting, Japanese woven baskets are featured in front of an actual tea house. Good design is universal - and timeless. 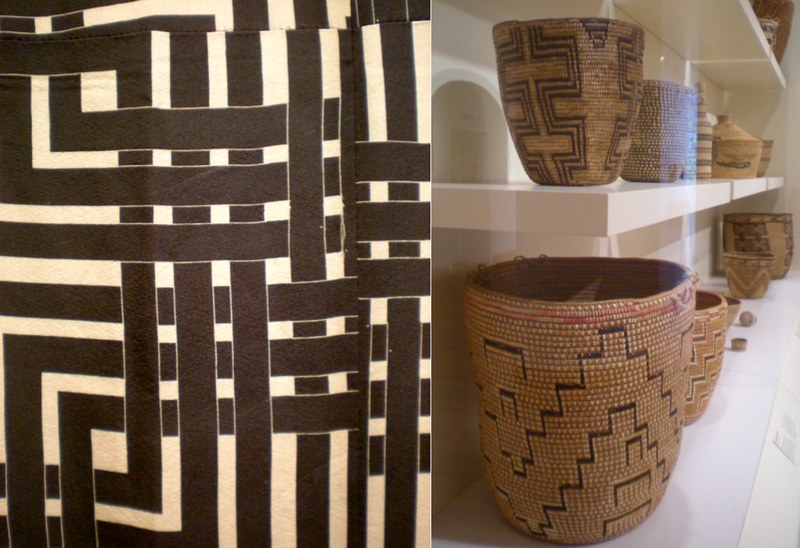 Patterns woven into a Japanese kimono and Native American baskets are similar, yet they come from opposite coasts of the Pacific Ocean. Each basket is unique, made with natural materials such as of cedar root, alder bark, cedar bark, bear grass, horsetail root, huckleberry, sweetgrass, or rye grass. The geometry of the woven basket designs contrasts with the carved curves of stylized birds, animals, gods and ethereal beings in the Northwest Coast objects that follow. Though Tlingit, Haida, Klamath, and Salish are more well-known, there are, or were, at least thirty tribes in the Nortthwest coast, each with their own languages. Seattle incorporates art into every aspect of city life, and the influence of the Northwest tribes can be seen everywhere. Including sewer covers. Here's a challenge to other cities: how cool can you make your sewer covers? Get thee to a museum and start looking for inspiration! These huge cedar totems are called house frontal totems because, together with the cross beam at the top, they formed an entry portal to the front of a house. Two other types of totems were interior totems, used to support roof beams, and free standing memorial totem poles to honor the deceased. I was surprised to learn that the common phrase "low man on the totem pole" meaning "least important" couldn't be more wrong. In fact, the lower ten foot section is reserved for the best carver, because that's where it's most closely observed. Lesser quality workmanship isn't as noticeable at higher levels. 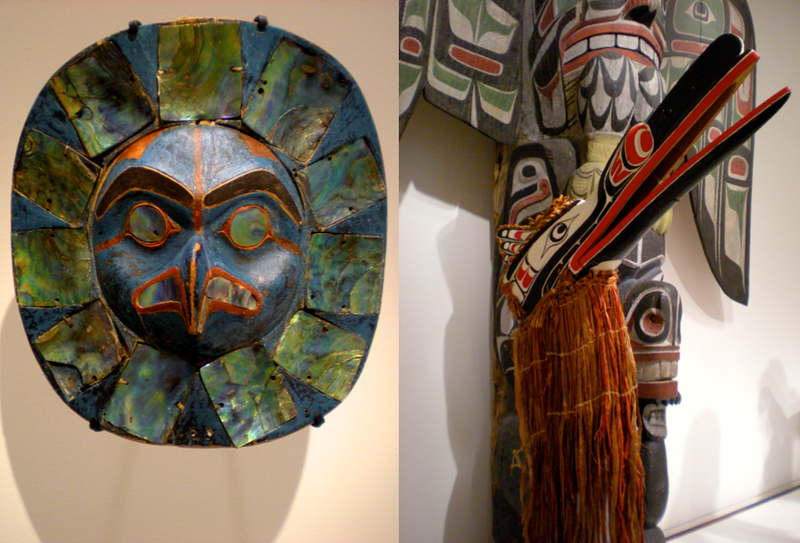 Learn about Haida masks and the importance of this Raven dancer costume here. Bentwood boxes are what they sound like: a single cedar plank was steamed, then bent and joined at the sides before being carved and painted. Other boxes were carved out from the inside, steamed and shaped, much like the process of making a canoe. Northwest Coast designs have many similarities to that of Papua New Guinea and Irian Jaya. Strong, bold, painted designs enhance the shields, but a closer look reveals they are carved as well. Walking to the next gallery through a forest of shields and totems, some over ten feet high, was a bit otherworldly. Taken from the Ojibway word dodaem meaning "brother/sister kin", totems are used to spiritually represent a clan or group of related people. Though most commonly associated with the Haida or Tlingits of the North Coast, totems have been found throughout the world, from ancient China and the Himalayas to Korea's Jangseung and Poland's Rodnidze. These painted Aboriginal totems depict fish, turtles, humans and snakes. The pink artwork and the striking sun with rays below are both by contemporary Aboriginal artists. And now on to Part 2 of our visit to SAM. Keep reading and enjoy! Sculptures held an important place in Aboriginal Art. Tiwi posts were put into the ground all around the grave sort of as a memorial marker as we do the gravestone today.